Have you ever found yourself in the position where a CD or DVD was stuck in your Mac's optical drive? Depending on the Mac model you own, getting the stuck disc out can be difficult, if not nearly impossible. Or at least, so it seems. The problem arises because Apple has completely hidden the optical drive's mechanical eject button on most Macs. Yes, that's right; Apple's desire for cutting-edge design has resulted in one of the basic ways to eject stuck media no longer being an option for Mac users. In the Windows world, you'll find the optical drives on most PCs have a small hole near the front. Stick a paper clip into the hole, and the drive will eject any media in the drive; very convenient. On the Mac, the hole is missing, and all eject functions are performed electrically by sending an eject command to the drive. This shouldn't be much of an issue for Mac users, as the result will be the same. Who cares whether the ejection was performed because of a paper clip or the operating system sending an eject command? Turns out there's a big difference, If your Mac uses a slot-loading optical drive, such as those used on iMacs and MacBooks, your Mac only sends an eject command if it senses there's a CD or DVD in the optical drive. If your Mac doesn't think there's anything in the drive, no eject signal is sent. Why Do CDs and DVDs Get Stuck? CDs and DVDs can become stuck in your Mac's optical drive for many reasons, most of which seem to have to do with the phases of the moon. OK, there are actually real reasons why they get stuck ranging from dirt and debris in the drive or on the disc to using the incorrect media type in an optical drive. Never insert a non-standard CD/DVD, such as the mini-sized versions of the one that resembles a business card into a slot-loading optical drive. It's a recipe for stuck media. When media becomes stuck in your Mac, don't spend all evening howling about the problem; instead, try a nifty trick that usually will eject stuck media. If you have a slot-loading Mac, including portables, Mac minis, and iMacs, you may find yourself unable to eject a stuck CD or DVD because your Mac has already unmounted the media. Once the media is unmounted, your Mac may not respond to the eject command because it believes there is nothing in the drive, and therefore, nothing to eject. There are various ways to force a media eject. This one, using the Boot Manager, is pretty simple and almost always works. Power on your Mac while holding down the option key. When the Boot Manager appears, it will display all bootable drives. Press and hold the eject key. The stuck CD or DVD should come flying out of the optical drive. Once the CD or DVD is ejected, you can use your mouse to click on the drive you want to boot from, and then finish booting. This trick works because your Mac doesn't check to see if there is any media in the optical drive at the Boot Manager screen; it just performs the eject command. There's a rare case where you can end up with a disk stuck in your Mac and not be able to access the boot manager. This can occur in a Mac that either has no startup drive or has a brand-new startup drive that hasn't been formatted yet. The boot manager may not be able to find any device that could be used to boot from, so it never appears on the screen. After waiting a reasonable amount of time, you can go ahead and hit the eject key on an Apple wired keyboard, and the eject command will be sent to all removable drives, including your optical drive. This last tip may work on some non-Apple keyboards as well, but it seems to be dependent on the specific keyboard design. 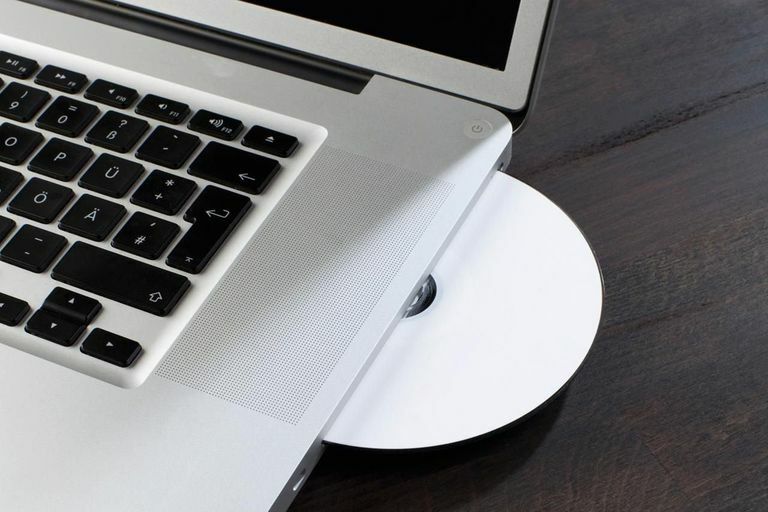 Do You Know All the Ways to Eject a CD/DVD From Your Mac?